The Oscuro wrapper of Liga Privada No. 9 cigars is hand fermented for over 18 months, and only four pairs within the factory are certified to produce this limited production cigar. 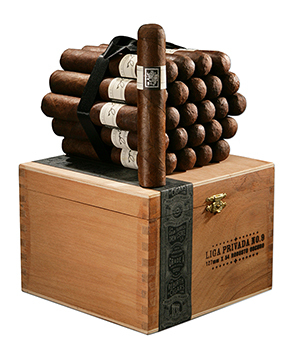 Aged a full year before sale, the lush, earthy, espresso-like Liga Privada No. 9 cigar is rich and full-bodied without being harsh. Exquisitely crafted from Connecticut Broadleaf No. 1, plantation grown Brazilian Mata Fina, and select Honduran and Nicaraguan Cuban seed, this cigar is flawless in construction, flavor, and character. Steven Saka, president of Drew Estate, says of the Liga Privada, "When you light a Liga Privada No. 9 you are smoking a puro that was intended and expected to be smoked by me personally. Aged a full year, no expense has been spared or shortcut taken in its creation, as I expect cigar perfection with every puff." Milan Tobacconists, Inc. is a Liga Privada No. 9 appointed merchant.